For Sale: UTC tx-1012-01-1 - Secure Tech, Inc. The UL approved Micro Door/Window Sensor is a completely wireless sensor that detects the opening and closing of doors and windows. 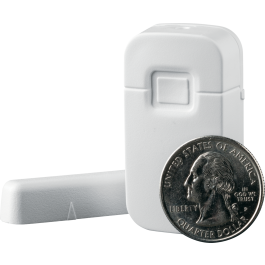 The sensor’s compact size provides for clean-looking installations; ideal for using on drawers, safes, cabinets and just about anything that can be opened and closed. Powered by a 3VDC, lithium coin-cell battery and employing crystal technology for signal transmission, the Micro Door/Window Sensor has an estimated battery life of 5-8 years. * The Micro Door/Window Sensor uses Learn Mode technology, enabling it to work with all Interlogix systems. Each sensor is given a unique identification code at the factory, a TX ID, which makes it possible to learn sensors into the panel remotely or before arriving at the job-site. The Micro Door/Window Sensor is supervised, which means at least one time every 64 minutes a battery and sensor status signal is sent to the system’s control panel. Supervised sensors provide system users the reassurance that sensors are working correctly.